There are few home renovation projects discussed with as much distaste as removing wallpaper. If you have ever tackled this task or know someone who did, it appears that this may be one of the most hated jobs for the DIY home improver. I had never had the need to remove wallpaper before making the great unknown a little intimidating. Luckily, there was only one room in the new house with wallpaper so it couldn’t be too bad, right? Perhaps I am in the minority, but for our house, this turned out to be one of the easier projects. After several days of reading up on the subject, it is apparent that there are many factors that can make this project easier or harder (i.e. how long has the wallpaper been up, how many layers of wallpaper are there, etc.). While I do not know how long the wallpaper was present in our current home, there was only one layer. The process we used to remove the wallpaper was easy and only slightly messy (much less than taking down the popcorn ceilings), but it is time-consuming. To remove one room’s worth of wallpaper, it probably took about a full day. This is a very inexpensive method and you probably have some of the materials already in your possession. If you are hesitant about taking on this project, don’t be. This is a good project for a beginner and is an easy way to save money in your home by doing it yourself. You will also want to have a trash can and/or trash bags on hand. It took two full trash bags to contain all of the wallpaper remains. 1. Prepare the floors with the plastic drop cloth. 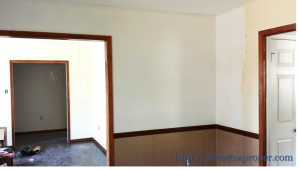 If the room where you are removing the wallpaper has hardwood flooring or carpet, you will want to put down a plastic drop cloth to catch any of the wet wallpaper pieces or water drips. I did not cover the entire floor with drop cloth, but rather moved the drop cloth with me as I worked in sections. 2. Pull the wallpaper from the wall and discard. Depending on the type of wallpaper that you have will determine whether you can begin with Step 2 listed here or will have to skip this step and move on to Step 3. For the top portion of our wallpaper, it was made of a very thick paper. This made it quite easy to grab it from a corner and pull it down in chunks, leaving behind a thin layer of paper and adhesive. If you are able to do this, then do. Begin at a corner and gently pull back the wallpaper. If you are lucky, it will come off in large strips. Once you have removed it, throw discard the wallpaper strips. 3. Fill the spray bottle with fabric softener and water mix. 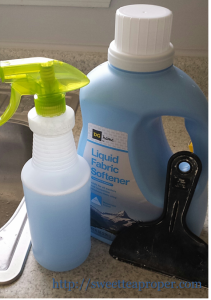 Using a combination of 1/3 – 1/2 container full of fabric softener and the rest with hot water, fill the spray bottle to the top. Let the excess bubbles flow out so you end up with a full bottle. Wipe the bottle dry. 4. Saturate the wallpaper or wallpaper backing with fabric softener mix. If the wallpaper did not pull off easily (like our lower portion unfortunately), spray a section of the wallpaper with the fabric softener mix. It is ideal to fully saturate the wallpaper. To eliminate excess water dripping, once you have sprayed the wallpaper or wallpaper backing, you can take a paper towel or rag and wipe off any present water drips. 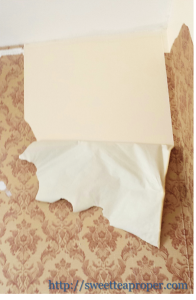 As you can see in the picture below (right), the bubbling of the wallpaper backing is a good sign that the paper is ready to be removed. *STP Tip – It is best to work in sections since the wallpaper needs to be wet for removal. If the water mixture dries, you will have to re-wet the area and start again. It also makes cleanup less dreadful. 5. Scrape the wet layer of wallpaper. 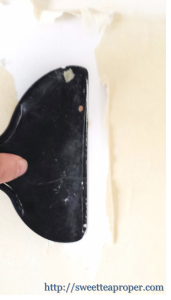 Using the plastic scraper, begin in one corner and scrape the wallpaper. Hopefully, if your situation is similar to ours, you should be able to scrape off sections of the remaining wallpaper. If you are really lucky, you will have large sections come up at once. Either way, this is the step that will determine if additional prep work is needed to remove the wallpaper in your home. If the wallpaper is not coming off, re-wet the area again. Wait a few minutes and try to scrape again. If that does not work, you might want to consider purchasing a scoring tool that is designed for wallpaper removal. 6. Remove the remaining wallpaper. Assuming Step 5 was successful, continue to spray and scrape the remaining wallpaper until all of the wallpaper is removed. To keep a relatively clean area, make sure to throw away all scrapings after you finish each section. This made the final cleanup a breeze. Here is a photo of the dining room, about a quarter way complete. Hooray for white drywall underneath! 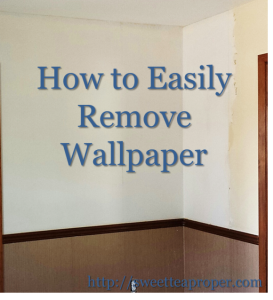 Have you removed wallpaper before? Do you have any tips that might help the first-timer? What was your experience? We would love to hear about it in the comments section!